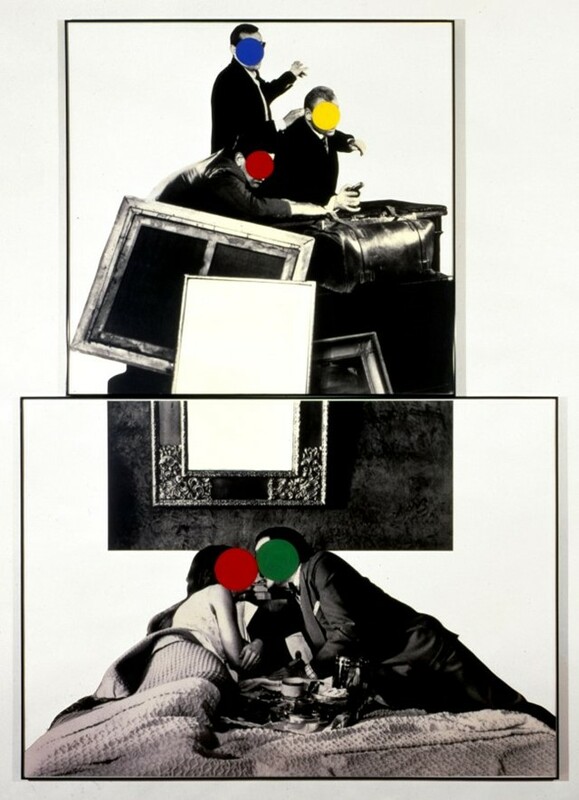 John Baldessari is commonly referred to as one of the pioneering forefathers of Conceptual Art, and he is undoubtedly one of the most influential artists of the last 50 years. Always ready to take risks, the revered Baldessari burned the majority of his early paintings back in 1970 in the often-cited The Cremation Project, which marked both an end, and a Phoenix-like starting point to the rest of his career. Juxtaposing seemingly incongruous imagery with text, Baldessari confronts the viewer to question preconceptions and meaning but never fails to inject his works with a heavy dose of humour. Breaking from the confines of the traditional rectangular format of both canvas and photograph, he has played with the composition of his work for the past three decades, employing a dizzying variety of unconventional shapes and configurations. He omits information in his photomontages by fracturing his found imagery or masking areas with colourful circular interventions, so that you’re always left very aware that he is toying with the apparatus of your perception. John Baldessari Pure Beauty at Tate Modern until January 10, 2010. Hands and/or Feet (Part Two) at Sprüth Magers Berlin until January 16, 2010.